I certainly have changed since the rebellious teenager that I was so many years ago. Back in those days I never imagined that I would ever go to the theatre, I thought Shakespeare was boring, and I certainly had no interest in looking at paintings hanging on the wall. Okay, I liked history, but part of that had a lot to do with it being full of bloody battles involving knights, swords, and people getting their limbs lopped off. In fact, come to think of it, back in those days I was rather baffled as to why fantasy wasn't in the mainstream when it could be just as violent as your typical cop or western movie. Well, Game of Thrones eventually proved me right. Yet, I look at myself now and see myself booking tickets to fly a thousand kilometers to another city just to visit the art gallery and look at a collection of paintings that have been brought over from Europe (even though I had basically already seen many of these paintings when I visited the Rijksmuseum). The thing with the Netherlands of the 17th century was that unlike the rest of Europe, it was a Republic as opposed to a Monarchy. This is interesting in itself because when we look at the history of Europe, many of us see that it is little more than a collection of kingdoms and the republic never really came about until after the French revolution - well, it turns out that this is not the case, particularly when you consider the Italian peninsula. Anyway, across Europe art was basically the purview of the nobility and the church, and you never really made it as an artist unless you had some patron, and you only got a patron if you were willing to paint what they wanted you to paint (and you also had some talent, but that goes without saying). 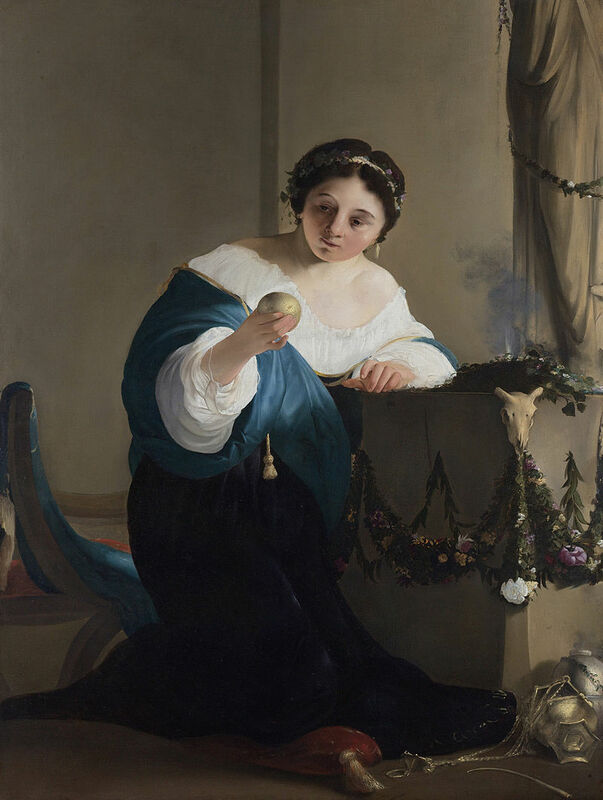 However, the Netherlands was breaking away from that mould in that art took on a much more commercial flavour, and the artist would sell their art on the open market. In fact, the first room in Rembrandt's house was full of artwork that he and his students had produced, and it was basically the gallery of works that were for sale. Like other posts where I have explored art exhibitions, I'll go through a number of the paintings that caught my attention, and say what I can about them. 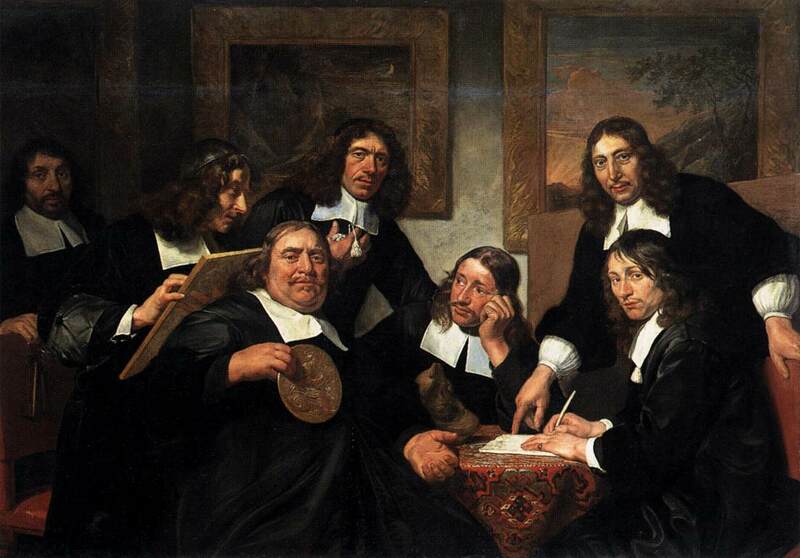 The first is by Jan de Bray and is called the Governors of the Guild of St Luke. 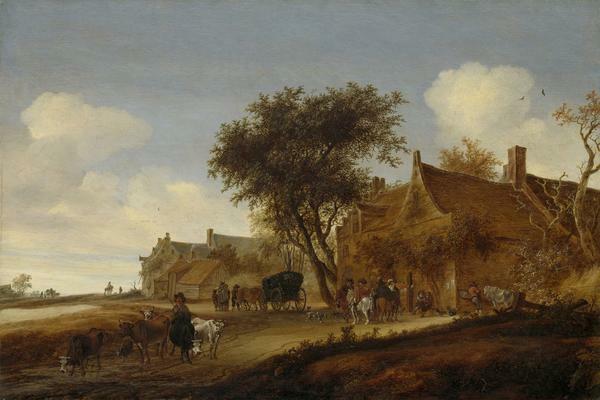 This was a painting that I remembered from the Rijksmuseum, and pretty much defined the nature of the Netherlands at the time. These were the movers and shakers of the republic - the merchants and the guild masters. In a way, what we see here are the roots of the merchantilist society that eventually evolved into the modern world. The first gallery I visited contained numerous portraits. In a way this was an important aspect of the period because we are seeing the rise of the middle classes (at least in Northern Europe). At this time it was really only the aristocracy (and the upper echelons of the priesthood) that could afford to have themselves immortalised on canvas. 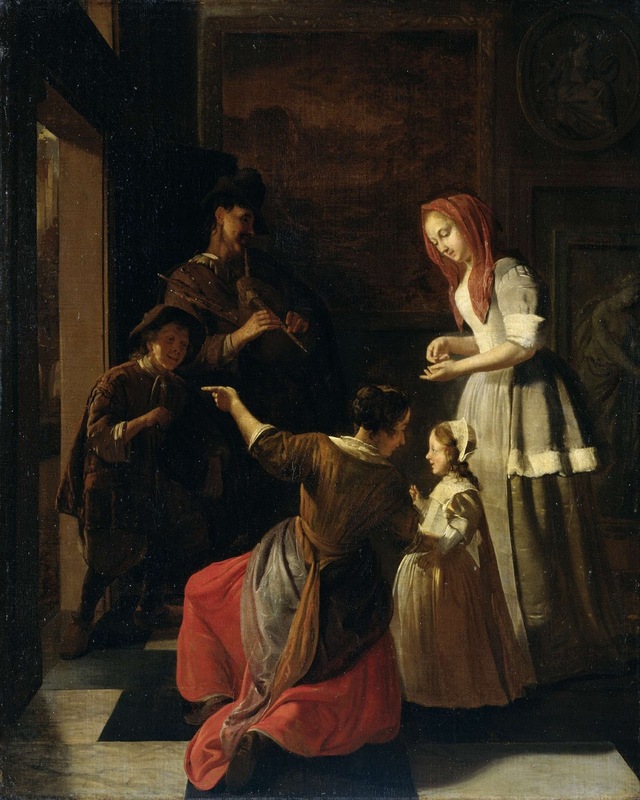 Yet the merchants and the traders of the Dutch republic were themselves becoming quite wealthy, and as such were able to afford the hefty price of having themselves and their families captured on canvas. Once again this gives us a window on the society of the time, to get an idea of their fashion. Anyway, here are a couple of paintings from this section (as well as the one above). When it comes to the Dutch, the term colonial empire never seems to come to the front of my mind, but the thing is that they did have one, and much of their wealth came from the control of the trade routes from the Indies. In fact, there are still a handful of islands in the West Indies that are officially a part of the Netherlands, but at their height, they controlled colonies all over the world, including what was to become New York (though at the time it was known as New Amsterdam), Brazil, South Africa, India, Mallaca, and of course the East Indies (modern day Indonesia). In fact the Dutch retained control of Indonesia right up until the 1950s, which is why there were a lot of Dutch being forced to build the Thai-Burma railway (aka the Death Railway). The Dutch have always have an affinity with the sea, which probably had a lot to do with them not only being a coastal nation, but also creating their nation by carving it out of the seabed. As such, it is not surprising that a lot of the art has a strong nautical theme. 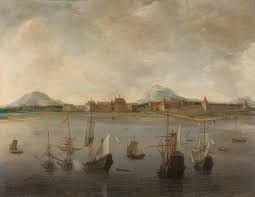 Take the following painting for instance, Dubbels' View of Batavia, which has fascinated me in the past because we are looking at the city that was to become Jakarta (the capital of Indonesia). Being an Australian, and with Indonesia being our northern neighbour, it plays heavily in our social conscious, and it is always interesting looking back as its foundations. As a side note, you could also consider Indonesia to be Australia's Mexico. Another style of painting that captured my interest when I was at the Rijksmuseum were the naval paintings, particularly the ones where the ships were either on the seas during a storm, or during a battle. 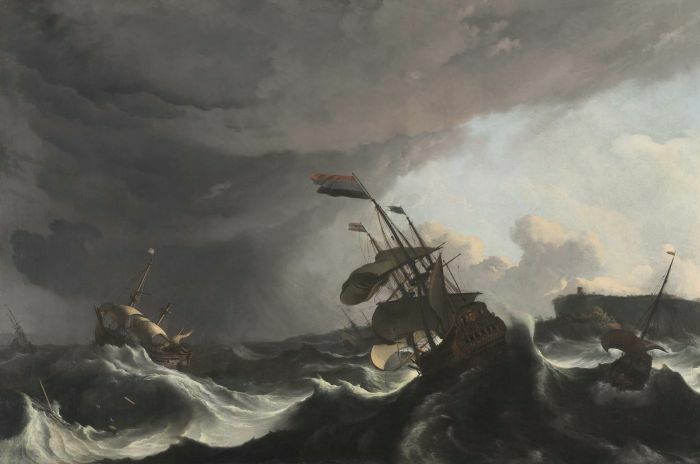 The following painting is by Ludolf Bakhuizen and is called Warships in a Heavy Storm. Of course, I doubt he painted them when they were in the storm (taking a photo during such conditions is hard enough - try painting a picture), but it is impressive nonetheless. Well, as it turned out, many of these artists actually sailed with the Dutch Navy, including Julien van den Velde, and would make meticulous sketches during their voyages. 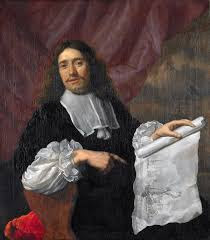 In van den Velde's case, he was with the Dutch navy when they fought against the English in 1666 (though they were later to become staunch allies), and proceeded to paint the Four Days Naval Battles. Unfortunately, the ones that I really liked at the Rijksmuseum, including the Battle of Dodger Bank, weren't here, but these paintings gave us a pretty good idea of what to expect. The next gallery brought us into a room containing works of nature. About this time the Dutch artists, always looking for something new to paint, would wander out into the fields to seek great places to capture on the canvas. In many cases they would take a sketch book with them, and then return home to complete the work. Landscapes, however, have always been a favourite of artists, to a point that there is even a size that carries the name, probably because having the horizontal axis as the longer axis allows the artist to capture a larger area, where as humans tend to be tall as opposed to wide. Another thing about Holland is that it is flat, and wet, which is not surprising since the country basically sits where the Rhine empties out into the North Sea (and a large part of it used to be underwater). In a way that location probably also had a lot to do with establishing the country as a merchantile superpower as they provided a port where ships and river boats were able to exchange goods, and the Dutch acted as the middle man. 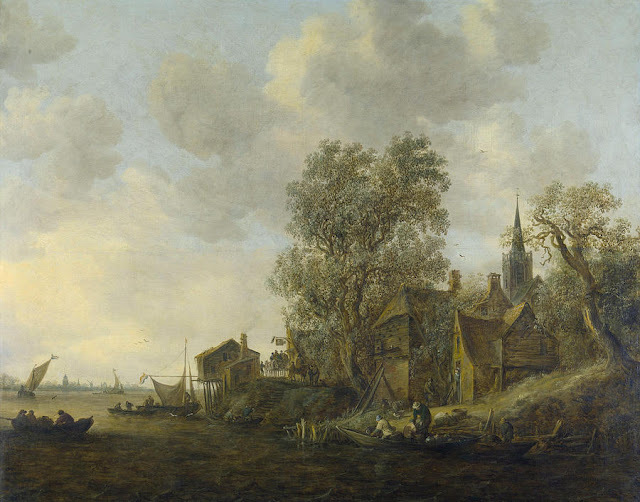 However, we aren't talking about trade, but rather about art, so the first is by Jan van Goyen, and is called 'A Village on the Edge of a River'. It turns out that the Dutch used to have a large presence in South America along the coast of Brazil, however over time that has scaled back to a small country on the northern coast of the continent. 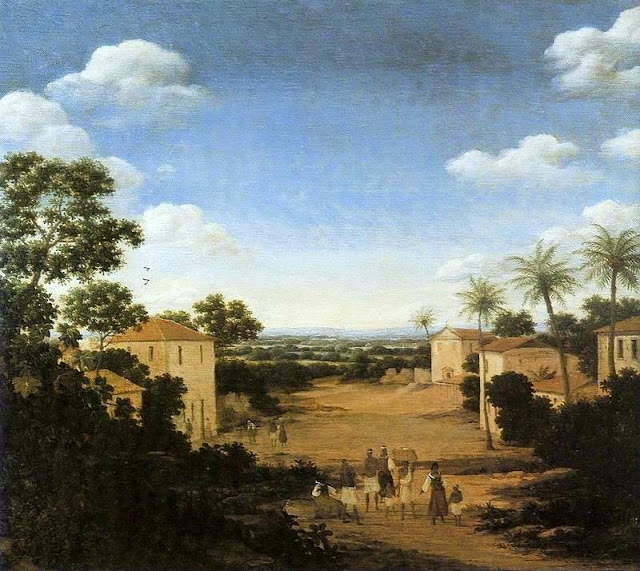 The next painting is of a scene of a Dutch Brazilian village by Franz Jans Post. If you look in the foreground you can even see some African slaves. Saloman van Rusydael's The Water Place certainly captures our attention, though I'm not entirely sure whether we can claim that the term 'Watering Hole' (which is colloquial for a bar) could be referring to both the river, and the inn. Yet, one thing that does seem to stand out are the dusty tones of the painting, because that is very reminiscent of Australian art. However, the museum seemed to be more concerned with the details of the figures in the painting. We now come to Jacob van Ruisdael, who happens to be the nephew of Saloman van Rusydael (though I notice that the surname is spelt quite differently). 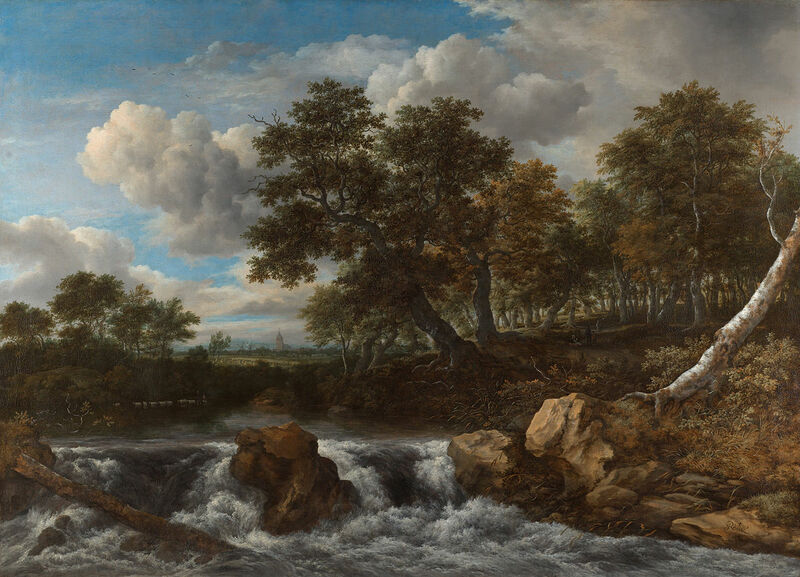 This one is called Landscape with Waterfall, and is an example of his interest in lively paintings. No doubt one requires much more skill to capture a moving object than to capture something stationary, and we also notice a similar thing when it comes to taking photos (and I notice night shots can be just as bad as well). The detail of some of these paintings is also exquisite. For instance, take note of not only the clouds, but also the village in the background. Along with the growth of merchantile trade, the centres of this trade, the cities and towns, also began to develop. This was particularly noticeable with Amsterdam, which exploded. Artists also took advantage of the growth in urban culture, starting to take notice of the architecture of the new buildings, the myriads of small businesses, as well as the many town houses appearing along the canals. 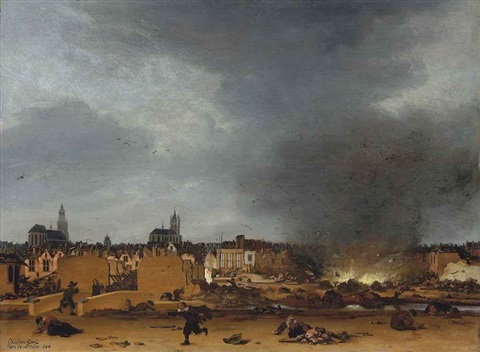 The painting below is by Egbert Lievensz van der Poel, and depicts the explosion of the gunpowder store in his home town of Delft. In fact his daughter was killed during the explosion, and it formed the subject of many of his paintings. This one is set during the moment of the explosion. 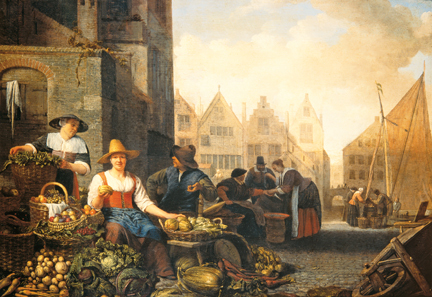 Here we have The Vegetable Market by Hendrik Martinez Sorgh. Markets have always been a staple of cities and towns throughout history, but here we see a new, bustling Amsterdam, where the merchants meet the farmers, and exchange goods and servants. The painting focuses on the woman, surrounded by produce. This is a changing dynamic in this world, as the merchants move from being subjects to a crown to becoming people in their own right. 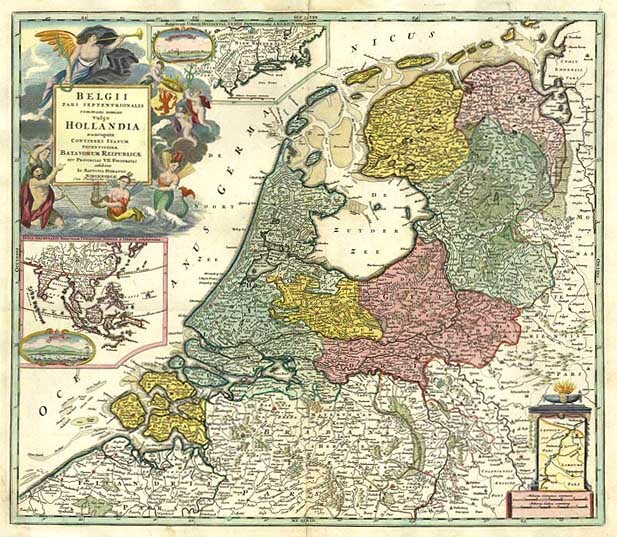 One of the things that happened was the growth of city scenes and maps, and this was especially the case with Amsterdam, which had become the centre of Dutch trade. The following is a sketch of the view of the city by Frans van der Hoeyen, which is a view of the city from across the river. Paintings such as these give us an insight into what the city looked like back in the 17th Century. In his paintings, Jan Ambrahamz Beerstraten would also bring the church to the front and centre, namely because that tended to be its position in village life back in the day. 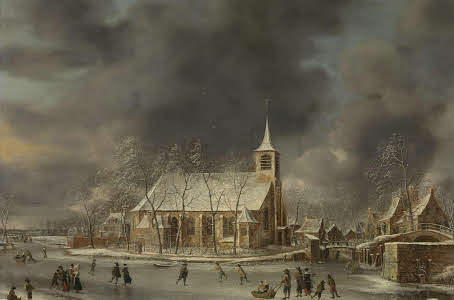 The following painting is of the church in Sloten, just outside of Amsterdam, during the height of winter. A lot of art in this period seems to consist of portraits of wealthy people. When I was at an art gallery with a friend recently, we commented on how these paintings really didn't do all that much for us. Well, that seemed to be the case with the Dutch as well since they started to explore the ordinary. 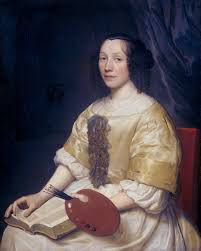 In fact the Dutch would paint anything and everything, and life in the home seemed to be a particular interest to them. Not only that, but there was also an incredible attention to detail, as we shall see in the following paintings. This painting is called 'The Players' by Jacob Ochtervelt and depicts some itinerant musicians playing in a refined house. Such musicians were common in the Netherlands of the period, and we have a younger boy playing an accordion with an older musician on the bagpipes. Notice how the women are encouraging the girl to hand them a coin. The scene in this painting by Pieter van de Hooch is reminiscent of a scene from modern life. We have been invited into the back yard of this well kept Dutch house, probably in Amsterdam or nearby Delft. While the maids are busily working, we have a couple spending some time in what is no doubt a lovely summers day. 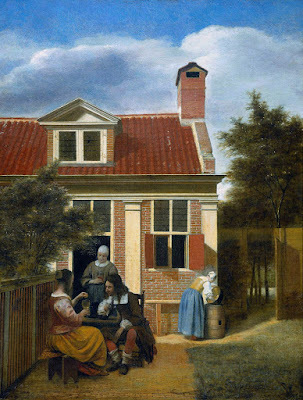 Jan Steen was one of those painters that always had a reason for painting the way he did. 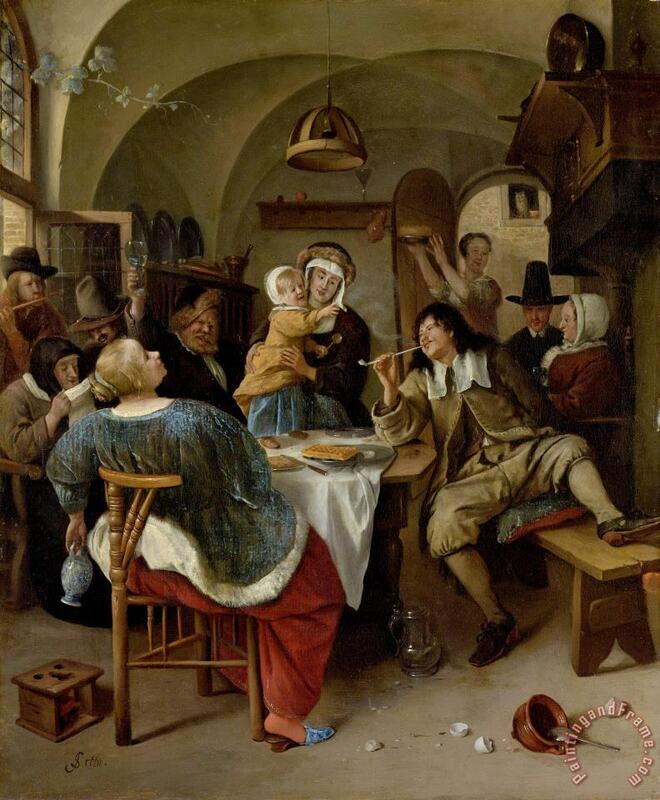 While this painting on the surface seems to be of a family just having a good time, it is in fact a criticism on the way some children are raised. Here we see adults setting a bad example for the children in the way that they are drinking and simply being debaucherous. Well, while there were lots of talented artists during the period, none of them even came close to the genius that was Rembrandt. While most, if not all, artists tended to specialise, Rembrandt would always be looking for new ways to push the boundaries, and to stun his audiences. Interestingly, Rembrandt is the only artist known by his first name. Unfortunately, his most famous work, the Night Watchman, didn't come to Australia, though I suspect that it never leaves its place in the Rijksmuseum. 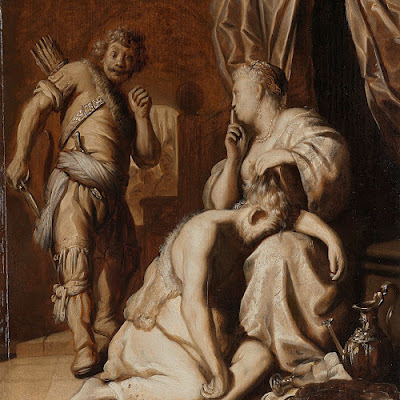 Rembrandt seemed to paint a bit of religious art, such as the above, which is from the story of Samson & Delilah. Here we have Samson, asleep on Delilah's lap, while the philistine sneaks in to capture the man that had been wrecking havoc on them for years. The gallery had a long description of the background of this painting, namely by going into details about the denial of St Peter. Mind you, being familiar with the story I probably don't realise that maybe it isn't as well known as I expect it to be. However, this is a very captivating painting, full of shadows with a single candle illuminating the face of peter and Christ, with the other apostles in the shadows. While we tend to look down on Peter for his denial, we quickly forget that out of all the disciples, he was the only one who remained. However, as dedicated as he was, he was also human, and Christ knew that, which is why he told him that he would deny him. Here is a really interesting work by Rembrandt. It is a self-portrait, but it is one where he is painting himself as the Apostle Paul. Honestly, I'm not really sure what he is trying to portray, whether it is some sort of self-righteous religiosity, or rather simply painting him as one of his Biblical heroes. 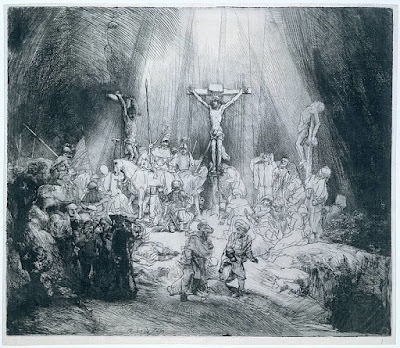 As we have seen above, Rembrandt was well disposed towards painting religious art, but in his own style as well. This is just another example. This is a magnificent etching, entitled Three Crosses. At first it looks like the whole scene takes place in a cavern, which attributes Rembrandt's mastery of shadow. However, the light shining down from above brings focus entirely onto the central figure and action - Christ dying on the cross, the turning point of human history. Note how the thieves are off to the side, but it is also a scene of suffering. Notice the two merchants walking away from the cross, as if there is nothing of interest for them here. Being a radical protestant country, the Dutch really didn't like religious paintings, at least in the church. 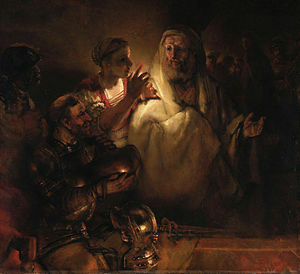 However, in the home that was a different story, and we note from above that Rembrandt loved to paint religious scenes. These scenes were a challenge though, because unlike painting the world about them, the artists needed to delve into their imaginations to bring these scenes to life. However, notice above how Rembrandt painted himself as St Paul - this was no doubt one of the techniques they would employ to try and make the scene as lifelike as possible. We aren't actually sure who painted this, though the details, and the contrast between Salome and the executioner, and the gritty details, suggests that it was a student of Rembrandt (which is why the artist is named as being 'the Circle of Rembrandt'). 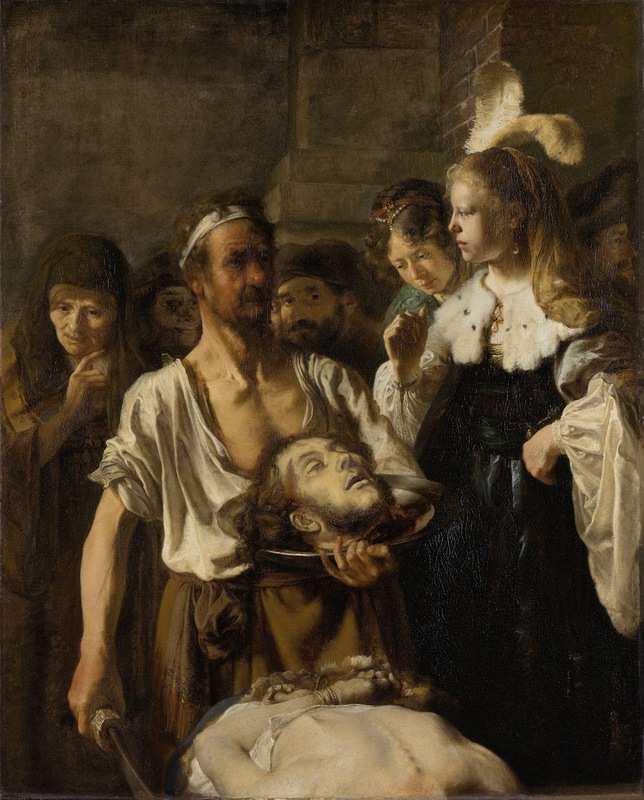 This is a scene where Salome, the daughter of Herod, is being presented with the head of John the Baptist after she asked for it when Herod asked her for anything within his power. The sophistication of Salome, and the brutal grittiness of the executioner is magnificent. This gorgeous painting by Paulus Bor is of a Greek myth not all that well known (I haven't heard of it). The story goes that Cyddipe was a noble born woman, and was being courted by Acontius, a guy whom she had no interest in. However, to get her to marry him, he threw a golden apple at her feet which was inscribed with the words 'by Artemis, I will marry Acontius'. Of course she picked it up and read it out loud, meaning that she had to follow through with the pledge. I will finish off with a painting of one of my favourite stories of Ancient Greece: the sacrifice of Iphagenia by Arnold Houbraken. 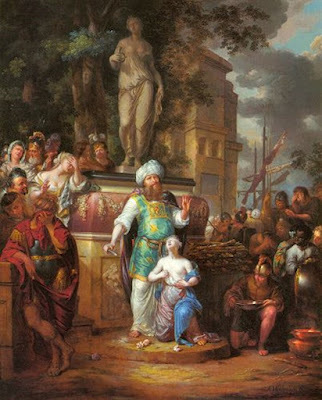 The story is that Agamemnon needed good winds to sail his fleet to Troy, but to get them he was told that he had to sacrifice his daughter, which he did. Mind you, while he was successful in taking Troy, his wife never forgot and he was murdered when he returned home. It was noted that the parents are covering their faces and looking away, though I do wonder who the character standing behind Iphagenia is. At first I thought it was Agamemnon, but I don't think so. Anyway, I'll finish it off here, but we will be returning to the art of the Dutch as I travel to the Rijksmuseum and explore the art that did not make it to Sydney, and also pay a visit to the house of the master himself - Rembrandt. I suppose it shouldn't be surprising that the reason I know the Netherlands were a republic is because of my musical background. Beethoven's iconic overture to Goethe's Egmont is a staple of youth orchestras everywhere, and it, naturally, tells of the struggle for Dutch independence from Spain. 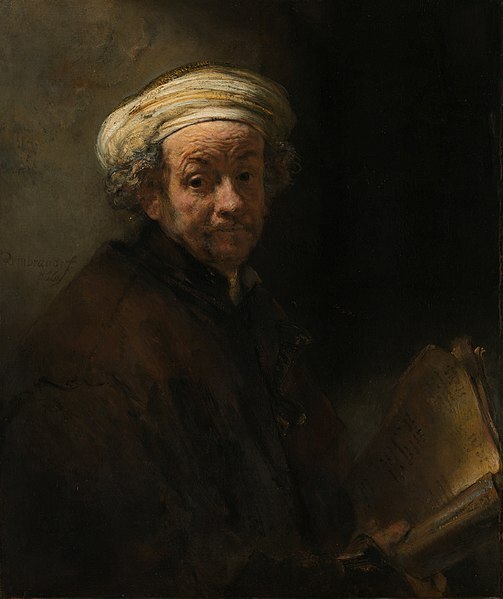 I remember the first Rembrandt I saw in person (probably at the Getty, but maybe at the De Young.) There are many paintings you admire. And then there are those that you just go "Oh. My. God." And that is what Rembrandt does for me. An online picture cannot capture just how amazing the detail and the emotion are in person. I didn't know that about Beethoven. Thanks for the tidbit. I agree about the paintings. The art gallery here in Melbourne has a couple of small Rembrandt portraits but the other works I've seen are breathtaking.